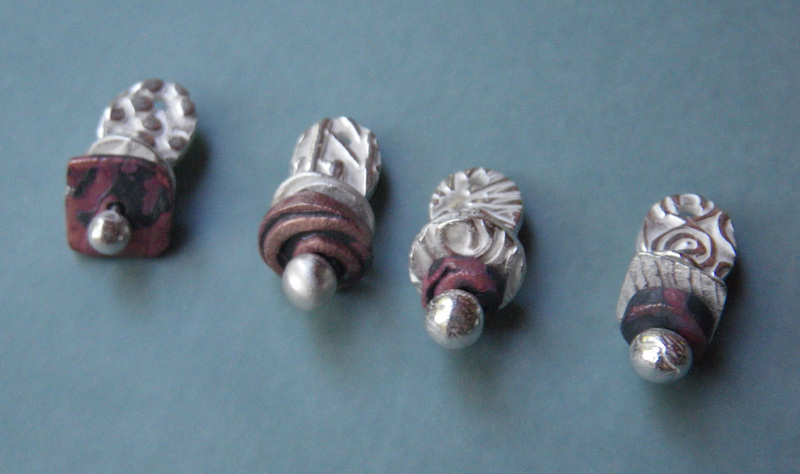 …or more accurately, a story about little charms; for the charm swap at the PMC conference this weekend at Purdue. I like to participate in the swap, but this year I gave myself permission to sit back and watch. Which meant, Yes, I came up with an idea at the last minute. I knew I wanted to make something that used small components, as I like having them on hand to combine with earrings or necklaces. I wanted to try making a headpin by embedding fine silver wire in a ball of PMC, to create a pin with an end that would have a larger ball than if I melted 18 or 16 gauge wire. I made a bunch of pins with ball ends, and a bunch of PMC discs, textured on both sides, and fired than for 2 hours at 1650º. (Thanks to Kate McKinnon for all of the tips and tricks in her FABULOUS new book, Sculptural Metal Clay. 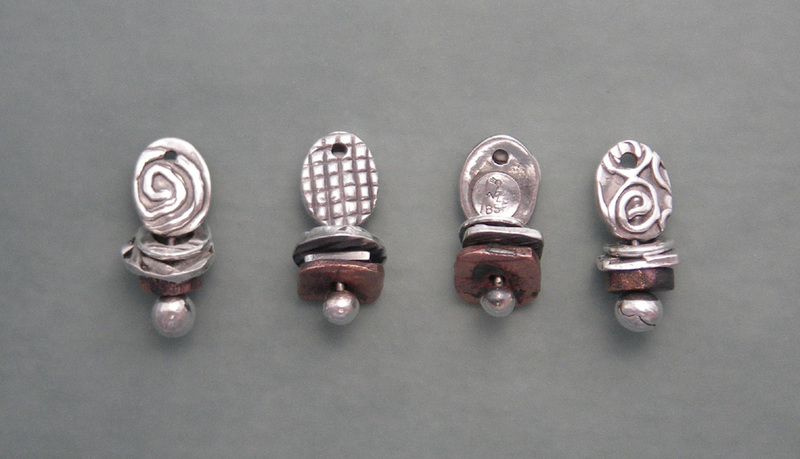 I used a number of her techniques in making this set of charms, including making all clean cuts, which eliminated the need for any sanding.) I also combined copper and bronze clays to make some base metal components. Once the first batch was fired, I stacked these little components on the pins with the ball ends, and cut out ovals of textured PMC, 7 cards thick. I imbedded the posts into these fresh PMC pieces and let them dry before firing. I did wonder how the copper/bronze discs would withstand a 1650º firing. It seemed hot for the bronze. Then I started wondering about fire scale on the copper, if it was reheated in the open air during the firing of the silver. So I fired the second batch at 1500º for an hour and a half. Fingers crossed that this would be long enough and hot enough for the silver clay t0 firmly hold the embedded head pins. 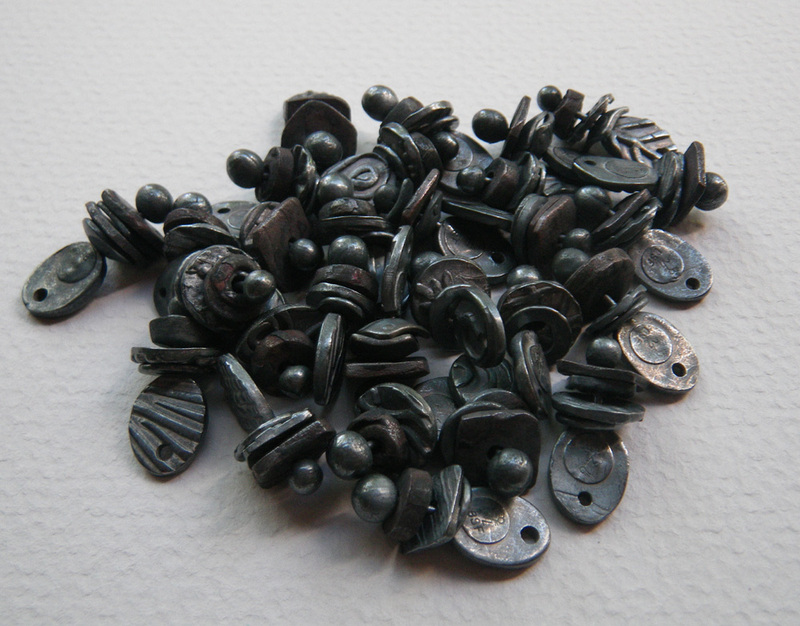 When the firing was done, I removed the pieces while hot and quenched them in cold water; hoping that would help with fire scale on the copper. I then added patina with liver of sulfur, to add some depth. I buffed most of it off with a muslin wheel and polishing compound. So, I have 2 dozen charms I am very happy with. 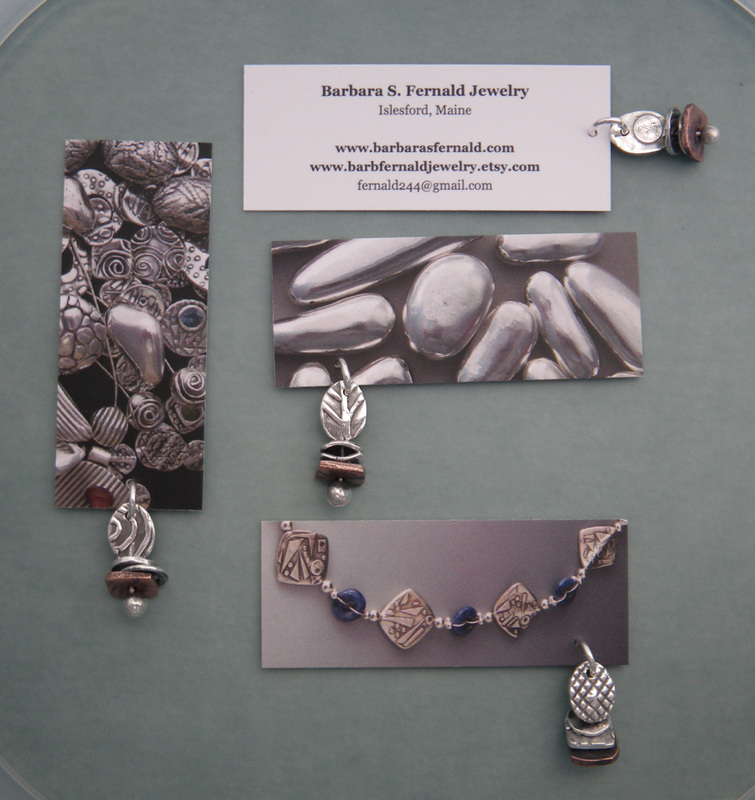 Even though the copper/bronze bead is not as planned, I learned so much from doing this, and I have new ideas for earrings as a result. I can’t wait for the conference to see my old friends, to make new ones, and to see what other people are doing in the world of metal clay. oh, look at THOSE! they look awesome! i can’t wait to see them in person! and are those little cards from moo.com? i love that shape! will you be heading off-island tomorrow, to start the journey? i have to leave the house at 3:15am to get my flight on thursday…yikes! Yes, Moo.com. I’ve been very happy with them. The tiny size fits in my small earring boxes. Plus I needed a card with my website/blog on it. You will be up just a wee bit earlier than I on Thursday. But I’m leaving here tomorrow at 11, getting the oil changed in the car and driving to Manchester. My flight leaves at 6 a.m. so I’ll be up early. Hope the first speaker is good, or we’ll be nappin’! I can’t wait to see YOU in person! I love these charms! I especially like the larger ball on the fine silver head pin. It’s giving me an idea for something I have wanted to do for a long time. Have fun at the conference. I think of you a lot, especially about your son in Afghanistan. I hope all continues to be safe for him and the troops. I really hope they all get to come home soon. I literally just rolled a ball of fresh PMC, and stuck the fine silver wire in it. No bend, no nothing. I moved it carefully when it was dry, to fire it with the support of some vermiculite. 2 hours at 1650º and voila! The wire does not pull out of the ball! Thank you Kate McKinnon for that trick! Can’t wait to see what you do with the idea.